Many Christians today have a hard time dealing with reality regarding what’s happening in their “beloved denomination.” We may not know all the details, but there are some things that are for certain regarding the end times. There will be no great revival, but there will be a great apostasy, of which we may well be in the midst of it now. Those who preach about a great revival as the precursor before Christ’s return do not know their scripture, or perhaps they do know and are simply ignoring the truth of what Revelation teaches us. In this video excerpt we see two events: in 1988, John Paul II led a worldwide service for peace that included spiritists, Buddhists, and other religions; and the other event depicted shows Pope Benedict leading an ecumenical prayer service, it seems almost unreal, but this “ecumenical spirit” continues today, as evangelicals are falling over each other in a race to be seen as full of love and unity with all “Christians”, regardless of doctrinal differences. You will notice various evangelical denominations represented in the prayer service, with some going so far as to kiss the pope’s hand. If this is not idolatry, what would you call it? This procession of misguided “Christian” leaders did not include anyone from the Nazarene denomination-yet; but give it time. After all, there are already many prominent leaders in the Nazarene denomination who are calling Roman Catholics our “brothers and sisters”, and who are introducing RCC traditions and rituals to Nazarenes in many churches and districts. Does God really guide such kinds of ventures? And is God guiding the Church of the Nazarene into joining with those who are marching slowly and steadily to join hands with Rome and the one world religion? Are there really no serious differences between the evangelical church and the Roman Catholic Church that would hinder fellowship between them? Apparently not to many of the Nazarene leadership, and it seems Nazarenes are joining the bandwagon happily, and ignoring the serious differences between the two. “To my Wesleyan, Reformed, Calvinistic, Pentecostal brothers and sisters… God really does use our Catholic brothers and sisters to bring people who have no faith into reconciliation with their creator God. To my Catholic brothers and sisters, and I know I preach to the choir this evening because you wouldn’t be here praying for Christian unity if you didn’t believe this, but to my Catholic brothers and sisters God really does use us Protestant types to bring people who are lost without their God into reconciliation with him. To those who have bought into the idea that for Roman Catholics and Nazarenes (or any evangelical Protestant) there is nothing that should cause them to break fellowship, I can see them nodding their heads and saying “amen. Perhaps they believe that the Reformation was a waste of time and should never have happened. And now leaders in the church are working hard to bring the Nazarene denomination a step closer to Rome. I recall at this year’s General Assembly, when at Mark Maddix’s seminar promoting contemplative spirituality practices, I was rebuked by him and several others who approached me later. Why? Because I spoke the truth and said that Roman Catholicism is a false religion. The evidence is everywhere. We have seen it with programs in every university and the seminaries promoting Eastern style mysticism (contemplative spirituality) under the guise of a better sounding phrase, “spiritual formation.” We have seen pagan prayer labyrinths at Trevecca Nazarene University and various churches, as well as trips to a monastery to “practice the silence” and mingle with the nuns and monks in their rituals. We saw this continuing promotion of contemplative prayer sponsored by the seminary itself, at the General Assembly in Orlando in 2009. Two years before that the seminary sponsored the same thing just before the M-7 Conference. Then there was also the Roman Catholic style prayer rooms at General Assembly, with books by mystic Richard Foster prominently displayed next to a Bible. We have seen books sold at Nazarene Publishing House that promote to the youth such practices as prayer beads, creating their own labyrinths, lectio divina, and recommending going on pilgrimages to the Taize interspiritual center in France. And at least one university, Point Loma Nazarene, has organized its own trip for youth to Taize. Then along came Ashes to Fire, a devotional book that continues the trend towards Roman Catholic practice. Remember the Nazarene video promotion showing someone receiving ashes to the forehead, Roman Catholic style? 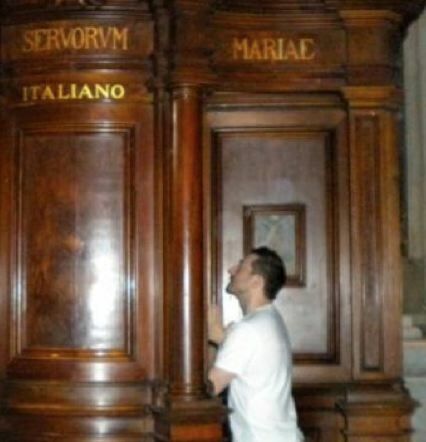 And then, the Nazarene pastor taking confessional at St. Peter’s in Rome, reminding his friends that he did not want to forget “his roots.” Or what about the heavy promotion of books by Catholic mystics recommended for a Nazarene camp in New Hampshire? You believe in biblical inerrancy? Big problem! Confessional in Rome? No problem. We now see a Facebook group, Sacramental Nazarenes, heavily promoting and talking about all the latest fads in rituals and ceremonies that they can all share and perform in their churches. The new president of Nazarene Theological Seminary proudly has displayed an icon of an Eastern Orthodox “saint” on her Facebook page. It’s all about ritual, and tradition, now for these people, and less about scripture and doctrine. And if you see the list of members of Sacramental Nazarenes, you will see leaders in the church, such as former General Superintendent Jesse Middendorf, and GS David Busic; Carla Sunberg, new president of the seminary; district superintendents, pastors, college professors and president – because they have bought into these ideas! There are so many more signs that the Church of the Nazarene is no longer the church that was used by God to bring the Gospel to my father and rescue him from Roman Catholicism and its false religion. Have you noticed pastors quoting Mother Teresa and other Catholic mystics in their sermons? The jesus of Catholicism is not the Jesus I know. So if that is true, how can there be unity? In fact, can there be unity when the official position of the Roman Catholic Church is that all of us are lost, unless we repent and return to Rome? Don’t these Nazarene leaders even know that much? Don’t they know what the RCC teaches? There is much more that is destroying the Nazarene denomination. There is the emergent church culture, that doubts most of Scripture. There is the godless evolution movement, being promoted aggressively by leaders in the church. There is now the signs and wonders movement, with many Nazarenes under the influence of such as Bill Johnson and Dan Bohi. There is the contemplative spirituality movement, which is bringing Eastern mysticism into the church. And finally, there is the fundamental denial that God’s word is inerrant, and if you dare to preach otherwise, or preach against the emergent church- you will lose your ordination unless you recant. And that has already happened. The only hope right now are the faithful churches that are standing against the emergent movement, regardless of criticism- and they do get it. They get it from district superintendents who are pushing the agenda. And the casualties along the way are the many faithful, Bible believing Nazarenes who have no choice but to leave their churches, and find another church. I urge those who have not any good options left, to shake the dust off their shoes, and leave the Church of the Nazarene. Don’t become part of Rome. A Facebook group called Sacramental Nazarenes has proven to be an in-your-face declaration that Roman Catholic thought is here among many Nazarenes, including those in leadership. This group is shamelessly promoting Roman Catholic thought, ritualism, and contemplative practices. Yet, when we shine the light on them, some of them protest the fact that we are exposing them! Now there is the increasing use of Roman Catholic imagery and icons. For instance, a District Superintendent, Carla Sunberg, who is a member of Sacramental Nazarenes displayed on her Facebook page a gift of an icon depicting a “saint” from the Eastern Orthodox Church, Saint Macrina. A little research about this “saint” tells us that she was the daughter of Basil The Elder, and a sibling of Saint Gregory of Nyssa. She was engaged to be married, but after her fiancée died, she dedicated herself to her religion, becoming a nun. Her younger brother Peter helped her turn her family estate into a monastery and convent. Not surprisingly, Macrina was a monastic, and also was known for adhering to an ascetic ideal. Asceticism is a lifestyle that is characterized by abstinence “from various worldly pleasures; it is “is the practice of strict self-denial as a means of attaining a higher spiritual plane.” (1) She slept on boards and kept no possessions. Many claimed that she had the power to heal others. In Luke 9:23, it says: “And he said to all, “If anyone would come after me, let him deny himself and take up his cross daily and follow me.” But asceticism takes this command to great extremes, including the inflicting of bodily harm on oneself, eating very little food, living in isolation, and other extremes. Nowhere in Scripture are we told to purposely seek out physical discomfort or pain. Yet, most of these saints participated in this unbiblical practice, to one extreme or another. Regarding some of her beliefs, in his book The Ancient History of Universalism, Universalist Hosea Ballou claimed that Macrina was a universalist also, based on her writings, and that she believed that the wicked in purgatory would all eventually confess Christ. Purgatory of course is one of the false teachings of the Roman Catholic Church and several other sister religions. J.W. Hanson also cited her as a universalist in his book Universalism: The Prevailing Doctrine of the Christian Church. Is holiness to be truly understood by the study of people who practiced asceticism and monasticism? Does the Holy Spirit really motivate someone to “touch many lives” by leading them into practices that have no basis in Scripture? Did Carla Sunberg miss answering this question in her six years of research? John 16:13 says that “However, when He, the Spirit of truth, has come, He will guide you into all truth.” Since practicing monasticism, asceticism, and universalist thought is not of God, then we can only conclude that Macrina was not transformed by the power of the Holy Spirit, but was changed by another “spirit.” How could Carla Sunberg have missed this? The continuing and growing trend of Nazarenes, including leaders and pastors, to embrace, and quote, and admire “saints’ of the Roman Catholic Church or Eastern Orthodox Church, and them claim they were great influences on John Wesley, is very troubling. I am not trying to beat up on Carla Sunberg, because she is not alone in this “new phenomenon.” But she is a leader in the church, and she was a serious candidate for General Superintendent this year. As I have said before, the national leaders (General Superintendents) have let this go on without comment, giving their tacit approval for pastors and other leaders to promote “saints” who taught ungodly and works-based practices. How far will it go? Well, here, you see a Nazarene pastor at a confessional booth at St. Peter’s Church in Rome. In his comments, this pastor said he wanted to remind his friend that he did not forget his roots. Really? This may well be his real roots, but apparently he has forgotten what the Reformation was about. Perhaps he never heard of the pope’s “shock troops”, known as the Jesuits and led by St. Ignatius, who vigorously and enthusiastically persecuted and killed many Christians. Yes, those roots; people who tried to deny ordinary Christians access to the Bible. Apparently the seminaries are failing to teach history to our future pastors, and here is the result. Am I missing something here? Am I protesting too much? Can the leadership at least put it in writing and officially declare what is already happening in the Church of the Nazarene? At least hypocrisy can be set aside, and they can be forthright with the people. When Your “Favorite” Christian Leader Is In Serious Error, How Do You Respond? Scripture teaches over and over that we are to separate from error. We are told to “have nothing with the fruitless deeds of darkness, but rather reprove them” (Eph. 5:11). 2 Cor. 6:14 says to not be yoked together with unbelievers. I am continually amazed, but also not surprised, at the fast pace of compromise in the Christian world, year after year. We are watching once solid leaders ignoring biblical principles of separation as they turn to hold hands with almost anyone who declares themselves Christian, in spite of clear evidence of apostate behavior. As Ken Silva points out in his recent article (David Barton Controversy), one leader after another is becoming involved in various joint ventures to unite all “Christians” with the goal of making the world a better place. The latest compromise is the Under God Indivisible Leadership Conference. It was held on July 27 and was described as “people of faith across the nation come together to call on God for the next Great Awakening.” In Pastor Ken’s article excerpt below, you will see what I mean by the compromise that has happened with such prominent and supposedly solid Christian leaders such as Ravi Zacharias, David Jeremiah, and Franklin Graham. Ravi Zacharias has shown signs of compromise in the past, so it is not the first. I was first taken aback when Ravi shared the stage with leaders of the Mormon church at their conference, and never once made it clear that that the Jesus of Mormonism is not the same Jesus of true Christianity. Then there was the time where he made a reference to Henri Nouwen as “one of the greatest saints of recent memory.” (video, at 5:45). Nouwen was a Roman Catholic monk who blended Eastern mysticism with Christianity. Ravi also spoke at New Age heretic Robert Schuller’s ReThink conference. How hard has Ravi fallen down? And how much more compromise will he make in the direction of apostasy? David Jeremiah is another who has made a terrible mistake by joining hands with this group. Jeremiah already has compromised in the past. He wrote a great book that exposed the New Age, but now he himself is promoting contemplative mysticism. Then there are well known evangelicals like Tony Evans, James Robison, and David Barton. They all decided to join the bandwagon of this ecumenical movement alongside false teachers such as John Hagee, Kenneth and Gloria Copeland, and also with Roman Catholic leaders such as Jonathan Morris and Robert Sirico. The lineup also included prominent political commentator Glen Beck, a Mormon who is fast becoming accepted as a fellow “Christian” by evangelical Christians. Why is this happening, and why are they sharing the stage with Beck? There are many others. The full lineup of speakers who compromised that evening is listed at the end, and you can listen to each of them here. Although the video is nearly three hours long, you will be able to jump any section to listen to a specific speaker. From time to time, I get a disapproving email from someone when I mention a favorite of theirs who has compromised the Gospel. I have been criticized for mentioning such popular folks as Beth Moore, for instance, who has been shown to not only be biblically unsound, but who is favorably promoting contemplative spirituality. I’ve been told not to “go there” as I continue my investigation of popular evangelist Dan Bohi and some of his teachings and associations, which I will be reporting on soon. As I bring to light information on what he is preaching, and what he is claiming to have done, and who he associates with- I wonder, what will you say? I have no doubt… in fact I am certain to lose some friends after that comes out. Yet, as Christians we are not to show favoritism towards any teacher or preacher if they start to teach anything that is contrary to God’s word. We should not overlook someone’s error and give them a free pass if it contradicts Holy Scripture. No one is above scrutiny except the One who is above scrutiny. Most of you would in principle agree with what I just said, but in practice, some of you fail at following this principle when your own “ox is being gored.” In other words, it depends on whether the criticism of that teacher goes against your own interests or not. This is dangerous territory, and is an indication of clouded judgment at best, and worse, an indication that you are experiencing deception that could continue to get worse and worse for you. What in the world is going on, when so many of these “great” leaders are continuing to fall by the wayside, and at the same time, so many of you cannot see the obvious right in front of your noses? I shudder to think how much worse it will get, but I believe it is going to get much worse. We are seeing signs all around of a widening apostasy, and it seems the true Christian church will be comprised of small groups scattered around the world, while the majority of “Christians” will become part of a worldwide unity of false Christians and other religions under the leadership of the Anti-Christ. There are certainly no indications in Scripture that the end times will bring a great revival in the church, as so many are saying will happen. Rather, Scripture clearly tells is that many will fall away from the truth, and the love of many will grow cold. Beware of making idols of your favorite preacher, teacher or pastor. It could come back to bite you very hard, and in turn could cause damage to those closest to you.